Some people think that permaculture is just about gardening. Of course, permaculture has a lot to say about how we grow our food, but, in fact, the application of permaculture principles is far wider and can be applied to buildings. use renewable resources and services. The video below by Kevin McCloud, presenter of Channel 4’s Grand Designs, introduces the idea of natural building. From clay and cob, to straw bale and timber framing, using natural and local materials is not only economical but creates a unique home that is strong and durable. Working in partnership with Low Carbon Trust, we run a number of building courses as well as events such as Green architecture day and Eco open houses. 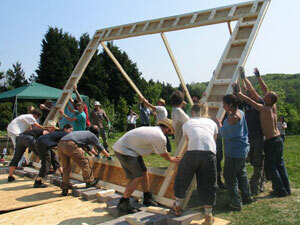 We are closely involved in Earthship Brighton and the construction of a straw bale Fruit Factory at Stanmer Park.